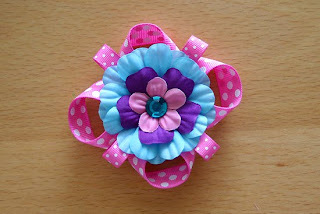 I created a set of hair bows for my nieces using some Bo Bunny ribbon, flowers and bling. I was able to get this photo of my youngest niece wearing one of them. Sometimes she doesn't hold still for very long! LOL!!! Here is the set I created to match various outfits of my nieces. 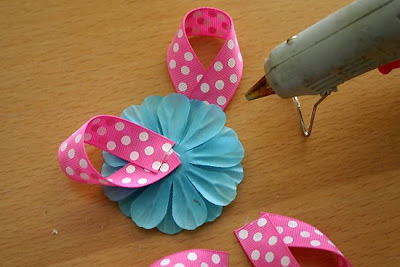 If you are interested in how to create some of these yourself, you will find a photo tutorial below. 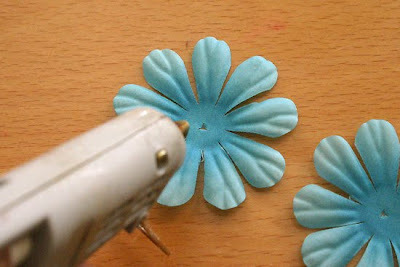 Hot glue the next size to the center of the largest two flowers. 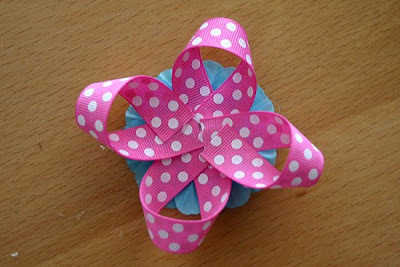 Finish by hot gluing the smallest flower to the center. 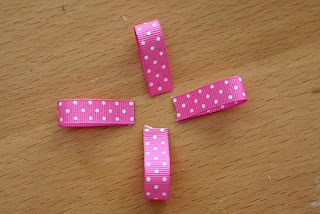 Cut four of the 5/8 inch ribbon into 4.5 inch lengths. 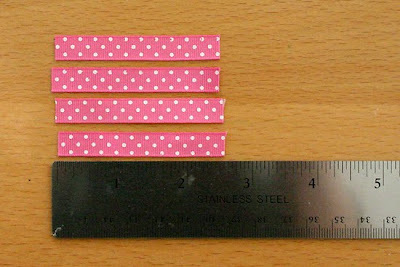 Cut four of the 3/8 inch ribbon into 2.5 inch lengths. 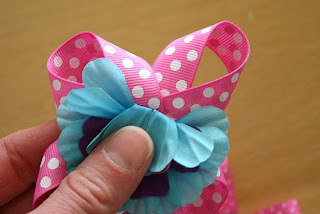 Make a loop with the 5/8 inch ribbon and hot glue the ends together. Repeat this will all four pieces of the 5/8 inch ribbon. 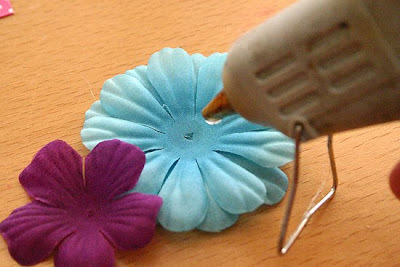 Hot glue these to the back of the flower. 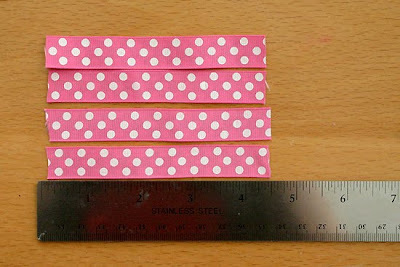 Fold the 3/8 inch ribbon in half and hot glue the ends together. Repeat this will all four pieces of the 3/8 inch ribbon. 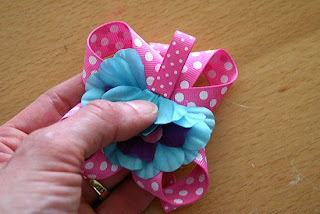 Fold back the flower petals where the large loops come together. 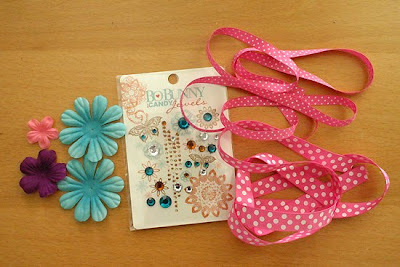 Hot glue the 3/8 inch pieces on top of these loops and underneath the flower petals. 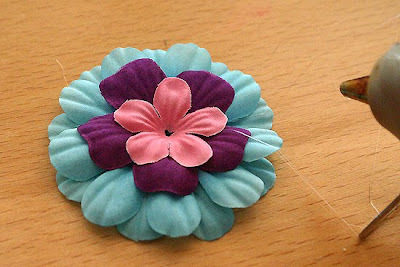 Finish by hot gluing a gem to the center of the flower. 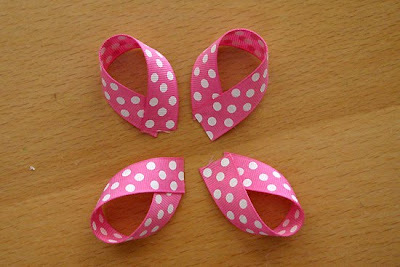 Attach your hair bow to a barrette or ponytail holder. I recommend sewing them on using fishing line. 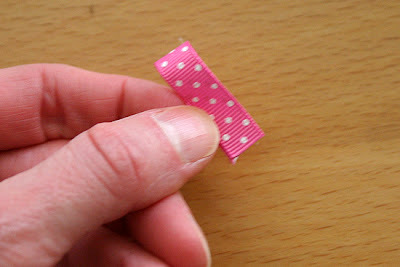 I found they stay on the barrette or ponytail holder better with this technique when little hands might be pulling on them! I hope you enjoyed this tutorial! Thanks for stopping by! These are just precious! My girls would soooo love these. 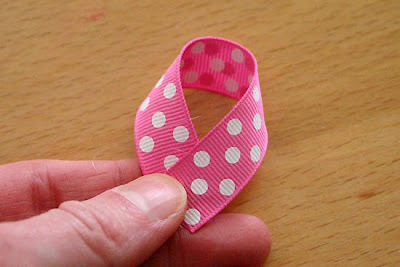 Gosh....these are so adorable, Juliana. Love it! My 8-yr old would ♥ those... just adorable! OH I am so making these for my daughter this weekend! Thank you so much for sharing this - you rock!!! you always have the best ideas!! those are gorgeous, TFS, juliana! So adorable! I will have to try and make some for the grand kids! Thank you for sharing!!! I soooo have to make some of these!! Those are absolutely adorable. You are very talented. I have enjoyed your blog a great deal, and will be back to visit soon.